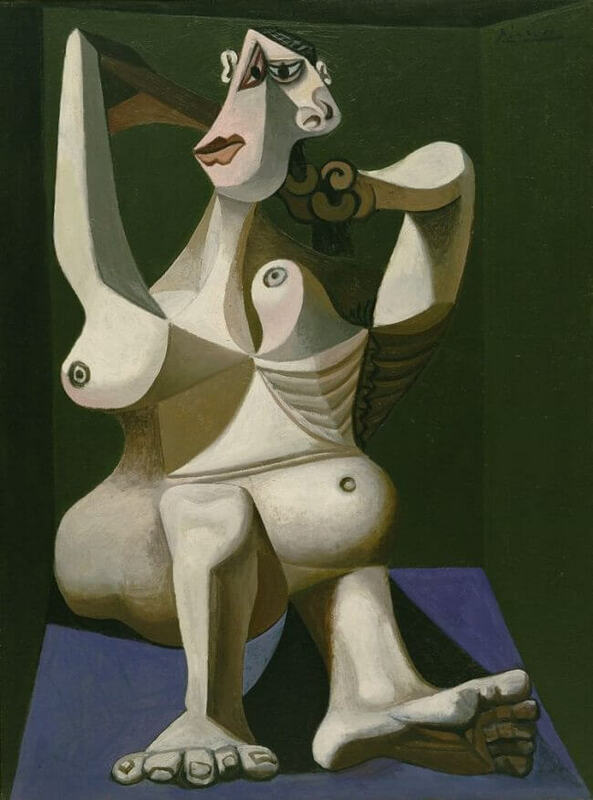 Picasso painted Woman Dressing Her Hair in 1940. Again Dora Maar is the woman who appeared in the painting. Here Dora is grotesque: her ribcage like a hanging carcass of meat, her hands like goat's hooves wringing her hair, her skin hard and leathery, her body both bulbous and emaciated and her feet outrageously oversized. She's trapped in a small room with a purple floor and green walls. The immuring of the woman-sculpture within the cubic cell is a reversal of the traditional idea, expounded by Michelangelo, of the sculptor 'liberating' his figure from the solid block of stone. The sculptures by Michelangelo which express the 'liberation' concept of carving in the most perfectly emblematic way, The Rebellious Slave and The Dying Slave by Michelangelo, were favourites of Picasso's and he must often have looked at them in the Louvre. (In 1946 he was given full-size plaster casts of both sculptures when he was working at the Palais Grimaldi in Antibes and kept them for the rest of his life.). One catches a surprising number of echoes of them in Woman Dressing her Hair, especially if one imagines the painted figure as a free-standing sculpture, and the idea of enslavement was the perfect metaphor for the condition of the French people under Nazi's Occupation.